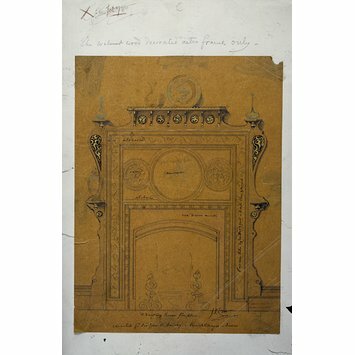 John Dibblee Crace first came to public notice through his Gothic- and Renaissance-style furniture for the International Exhibition of 1862. His clients included the 4th Marquess of Bath for whom he redocorated Longleat, and William Waldorf Astor who commissioned him to decorate Cliveden (ca. 1895). The Crace family were the most important firm of interior decorators working in Britain in the 19th century. They worked for every British monarch from George III to Queen Victoria and on a range of buildings that includes royal palaces, Leeds Town Hall and the Great Exhibition building of 1862. 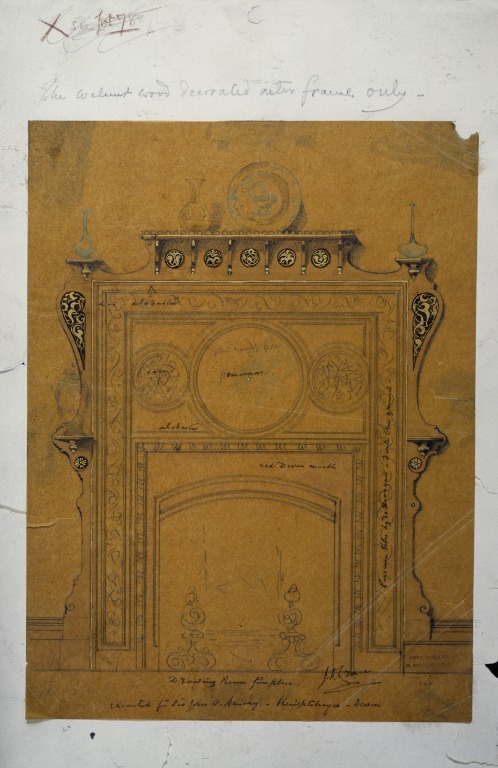 Design for a fireplace, elevation, section and details of mouldings; by J.D. Crace, 28 June 1875.